This beautiful box was custom built for a treasured collection of bracelets and necklaces. The Eucalyptus wood selected for this box has a spectacular grain pattern that flows around all four sides. The Black Walnut adds a dramatic flair to this composition. 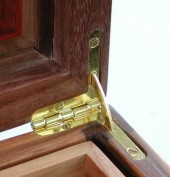 The drawer sides and dividers in the interior are made from solid Cherry wood. Notice how the interior of the top is finished as beautifully as the exterior. That takes extra time and material .... but, the result is well worth it. Overall exterior dimensions are about 11" x 9" x 4.5"
The interior of the upper level is about 10" x 8" and about 1.5" deep. The interior of the drawer is about 8.5" x 7.5" and about 1" deep. Tongue & groove joints secure the Black Walnut corners to the Eucalyptus sides. Sides are solid 1/2" thick Eucalyptus. Top is made of 1/8" Eucalyptus, bordered with Black Walnut and Eucalyptus, and laminated to both sides of 1/8" 3-ply plywood. This construction not only makes the interior of the top as attractive as the exterior, but also prevents warping of the top. Drawer sides and dividers are solid Cherry. Interior is lined with a luxurious faux suede.